All of this takes about three and a half minutes. The next forty-seven minutes are just "A Christmas Carol." Ostensibly, it's supposed to be the play he's starring in, but this doesn't really work. The characters aren't constrained to realistic sets, and events occur which couldn't be done in real time. We get a pan out into a stage and cartoon audience when there's a commercial break, but this feels tacked on. In addition, there's almost no use of the character of Mr. Magoo until the end. He's simply Scrooge in demeanor and in abilities. Throughout the vast majority of the story, there's no allusion to Magoo's infamous vision deficiencies. This changes in the last few minutes of the special, when they suddenly start dropping in mistakes the character would make, such as being unable to differentiate between a comically over-sized turkey and the seller carrying it. But, prior to the character's transformation, he never makes any similar mistakes. The story itself is surprisingly faithful to the original, in many cases right down to the lines and tone. The only major deviation occurs when they invert the order of the first and second ghosts. They also cut out Scrooge's extended family. But, then again, they did a truncated version of the sequence where Marley shows Scrooge the myriad spirits consigned to walk the Earth as shadows, and that's almost always cut. The special includes several songs. There's nothing particularly impressive, but they did seem to take them seriously for the most part. There are, however, a few exceptions, most notably the musical number built around the now farcically dastardly thieves who stole from the deceased Scrooge's estate. This wasn't the only bad call made, but it was probably the most obvious. The animation was about as simple as you can get: this clearly didn't have much of a budget. That said, the backgrounds were fairly well designed and evoked isolation, depression, and claustrophobia, as needed. It was clear that effort was poured into this special. But despite all the hard work, it just didn't age well. 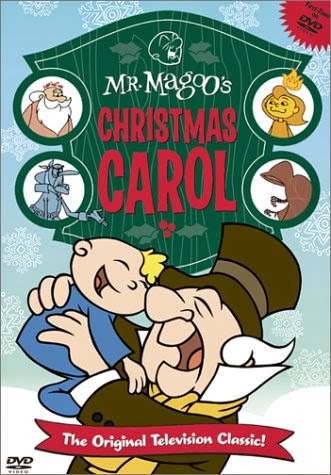 The premise was lacking a point: there was no reason to have Magoo play Scrooge if they weren't going to use him. Likewise, anything remotely well done in the animation or music has been done far, far better a hundred times since. Sure, its success opened the door for other specials, but there's absolutely a reason those became legendary and this has faded to barely warranting a footnote.